There are so many great ways to ring in 2018 in Toronto. If you’re planning to stay in the city over the holidays or happen to be visiting, then check out some of these fantastic events and start the new year as you mean to go on! Yuk Yuk founder Mark Breslin has curated the comedians for the 17th annual New Year’s event at Massey Hall. The host of the New Year’s Eve Comedy Extravaganza will be Tony Award-winning comedy legend, Robert Klein, and comedians include Pete Johansson, Maggie Casella, Michael Moses, Shannon Laverty, Dylan Mandlsohn, Tyler Morrison, Alex Wood, and Kyle Brownrigg. The event ends before the stroke of midnight so that you can keep partying. For two decades, global dance floor icon Sasha has been considered one of the world’s greatest DJs. Having taken over with his Last Night on Earth parties everywhere, Sasha has always given clubbers amazing lineups. Join him, Henry Saiz and dubspeeka on the dance floor of their New Year’s Eve party, Last Night on Earth, at Danforth Music Hall. Some of the best free New Year’s Eve public events in Toronto include spectacular firework displays, live music from DJs, and ice skating. City slickers should head to Nathan Phillips Square. Those that live further out of town can see midnight fireworks at Celebration Square in Mississauga. The New Year’s Eve Celebration in Brampton is great for families and includes kid-friendly events such as marshmallow roasting and an early fireworks show at 9 p.m.
On December 31, 2017, the Royal Ontario Museum is hosting a new event, a stylish dinner in their c5 Lounge. At ROM’s New Year’s Eve Celebration, guests will be treated to a three-course gourmet meal with wine service, complimentary welcome cocktail and access to an exclusive cash bar in their lounge all night long. A ticket to this New Year’s event also gets you early entry at 7 p.m. to see their new Christian Dior exhibition, presented by Holt Renfrew, until 9 p.m.
For something truly different on New Year’s Eve, ring in 2018 with a 5K run at the stroke of midnight and then celebrate with a party afterward. Midnite Run and Party is a flying way to kick off your fitness resolutions for 2018 or just race into the New Year with style—there’s a glass of bubbly or beer waiting for runners at the finish line. Everyone receives a medal, hot meal, and awesome swag bag with solid goodies. If you’re looking for a “quiet” New Year’s Eve, check out Hemingway’s rooftop party with a twist. Quiet Clubbing returns to Hemingway for one of the whackiest dance floors. On arrival, party-goers receive a special pair of wireless headphones and can tune into a music genre of their choice. DJs spin tracks on three different channels; each headset has a color LED that shows others what channel you are on so that you can dance along with people listening to the same music. When you want to chat with someone, lower the volume or take off the headphones; there’s no loud music to talk over! Sail towards the new year with Mariposa’s New Year’s Eve Cocktail Cruise. 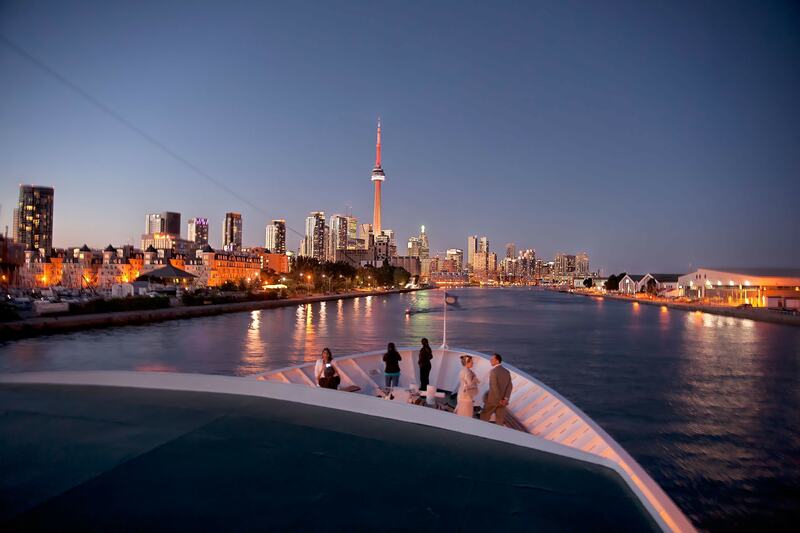 Spend three and a half hours drifting along Toronto’s waterfront with views of the city’s stunning skyline while dancing along to a DJ. Enjoy a selection of light hors d’oeuvres and a sparkling wine toast at midnight. There’s also a cash bar available with a selection of beer, wine, and some specialty cocktails.